New shelter dog not settling down? ​On average, a dog will adjust to its new home within 2 -3 weeks and will then feel more settled and secure but this is not always the case. We have come across many rescue dogs that just don’t seem to be able to settle in the new environment and the new owner is at a loss to know why. The most common type of behaviour we have observed is the dog that is aloof, not interested in its new people, wants to spend time alone and seems to make no effort at all to fit in. While all the family will be in the lounge watching TV, this particular dog will be in a bedroom, outside etc, and this keeps on occurring, even when the dog has been in the new home for an extended period of time. As we can’t read dogs minds, it is difficult to determine exactly what causes this to happen, but from the backgrounds we have been able to obtain, this seems to occur more in dogs that appeared to have a strong bond with their previous families, have perhaps lost a beloved owner due to illness or death and the dog may even be waiting for its previous owner to appear and take it home. In some cases it has been dogs that have spent a long period of time in shelters before being adopted. Many shelters have very high noise level and are busy places with people walking to and from, buckets and food bins being banged, hose pipes washing out the run, dogs barking and whining, and dogs that are not always suited to being together are placed either together, or in a run next to one another. All these factors can impact on a dog and cause high levels of stress and even depression. Other types of dog that often fall into the ‘battling to settle category’ when being re-homed, are dogs that were bottle fed as pups or taken away from their mother and siblings before 8 weeks of age. Of course, unless you have a background confirming same, this cannot be determined. Don’t ‘pander’ to the dog or force yourself on it. We as humans like to ‘fix’ things and the more you try to comfort the dog, there is the possibility that the dog will become more withdrawn. To a dog, a natural leader is somebody that is calm, is in control, looks after its pack etc, and not somebody who is constantly trying to comfort and interact with it. Taking the position of being in charge of the human/canine pack structure will help the dog to feel more secure. Rather have very short and positive interactions with the dog. Try to determine what the dog really likes. It could be a game of ball, pullies with a rope, a soft toy being thrown. Dont throw the ball from one end of the garden to the other initially, this does not always work – rather bounce the ball up and down in front of the dog, then toss a few inches away, and as the dog starts to get interested, then slowly build up the distance – the same with the pull rope and soft toy. Have frequent, short games with the dog in this manner. 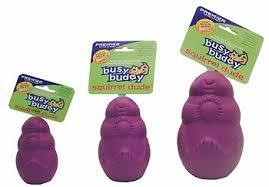 If the dog is not toy driven, but instead prefers food, then supply plenty of appealing chew toys such as the Busy Buddy Squirrel Dudes and other from the Busy Buddy Range. These can be bought on-line. Chop and change these frequently to provide variety and stimulation and have a look at the recipes for stuffing them in the De-stressing, Mental & Physical Stimulation article. When the dog seems more relaxed and is enjoying the bone/chew toy, instead of leaving him alone to enjoy it, place a special cushion for him in the lounge or kitchen (where people are) and place the bone on this. Do this for short intervals of time and make sure that the area the dog is in is not too rowdy and no other dogs to compete for the bone. This helps to slowly build up the dogs association that being with people is a good thing. At the same time, you can tell the dog from time to time ‘good dog, clever dog’, further building up the positive association. A lovely ‘scent/smell’ filled walk even just outside the property can work wonders. Firstly ensure that the dog cannot get out of walking equipment used and allow the dog to sniff and smell to its heart’s content. In humans, it has been shown that exercise has an effect on our serotonin levels (the happy hormone) and I have seen the same thing happen with dogs. As we have mentioned before, a dog’s sense of smell is about 45 stronger than a humans, and this is approximately over two millions more scent cells than we humans have. A dog ‘needs’ to sniff and smell to relax and stimulate itself and wehave seen many dogs where they just could not appear to cope, appear instantly happier after a short sniff around, outside the property. From time to time when the nose is not to the ground – call the dogs name in a happy voice, praise when the dog looks at you and offer a lovely treat. Another thing you can do where food is involved, is instead of feeding the dog out of the bowl twice a day, start to feed portions of food by hand, simply calling the dog to you and awarding a few pieces of kibble at a time. Dont use the whole of the dogs meal initially, start with a handful and you can gradually build it up and include some nice tasty treats. This further associates you with ‘good things’ and will help to build up the bond. TTouch. I have been involved in this wonderful modality for years now and am still blown away by the changes that can occur when it is used with fear behaviour and dogs like this (mind you I have never yet come across a situation where it does not help!). Have a look at the article on De-stressing & Physical and Mental Stimulation to see how to do a few of the touches that will help. Is there "One Thing" that leads to a well behaved dog? (Curly's secret)​ - Is it possible that there could be “one thing” which is the secret to having a well behaved and likeable dog? If so, what is this “one thing”? Is it the breed of the dog, the breeding of the dog, training, home environment, genetics, the owner’s attitude or just a random “gift from the gods” that causes a dog to be a really nice chap? My Dog Just Won't Listen! Regardless of our involvement with dogs - as pet owners, breed fanciers, dog sports competitors, trainers, rescuers - there is one thing we all have in common: there are going to be times when our dogs don't respond quite how we'd like or expect. Getting a 2nd dog - the pro's and cons. Having a dog has been a fun and wonderful experience for everyone in your family. In fact, it has been so rewarding that you are now seriously thinking of getting a second dog. However, it is important that you really think this decision through, because having two dogs can be an entirely different experience from having one.